Cherries are often used in alcoholic drinks for garnishing, but this delicious fruit also has a great flavor that is both tart and sweet. 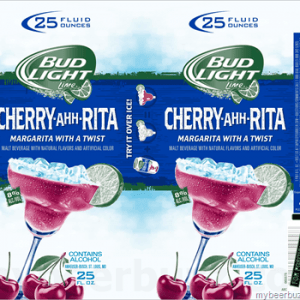 That is probably the reason why Anheuser Busch added this amazing and refreshing flavor to their growing Bud Light Rita family. The Bud Light Cherry-Ahh-Rita is a limited edition flavor for the fall and winter season. It is like Bud Light’s way of celebrating the end of summer and welcoming the colder days and even chillier nights. Below are the latest Bud Light Cherry-Ahh-Rita prices. This refreshing drink is a combination of Bud Light Lime and fresh margaritas with the sweet and juicy taste of dark cherries. The taste of dark cherries plus the hint of lime in a can of Cherry-Ahh-Rita compliment each other very well and will give you the little bite that you would expect from a great tasting and well-made margarita. The cherry flavor also goes well with the fizz in the drink and it can be described as more fruity than sweet. According to the manufacturer, Anheuser Busch, they introduced the Cherry-Ahh-Rita to continue encouraging the consumers and drinkers to celebrate life’s precious moments. They want the Bud Light Rita franchise to be a part of the special moments, especially in the festive fall and winter seasons. The Cherry-Ahh-Rita is available in different packs which include a twelve pack 8 ounce cans, four pack 16 ounce cans, and also available in 25 ounce cans. These cans are perfect for a trip to the beach or any celebration and gathering with family and friends. With 8% alcohol content by volume, the Bud Light Cherry-Ahh-Rita can definitely make your celebration more festive and fun. Since the Cherry-Ahh-Rita is available for a limited time only, you should take advantage while it is still available. You can drink ice cold Bud Light Cherry-Ahh-Rita straight from the can or over ice. But, there are also other fun and creative ways that you can enjoy the refreshing taste of this sweet and tart drink. Below are some idea that you can try. The simple syrup can be made by combining 3 cups of water with 2 ½ cups of granulated sugar. Bring to a simmer and cool down before use. Using a large pitcher, combine all the ingredients and mix well. You can adjust the taste by adding more simple syrup if you want a sweeter popsicle. You can also put chopped cherries or other chopped fruits into the popsicle mold before pouring the mixture. Put the molds in the freezer for at least six hours to ensure that the popsicles will be frozen solid. Once thoroughly frozen, run the popsicle molds under water for a few seconds to loosen the popsicle. Pop them out and enjoy. This is another version of the pink lemonade, which combines two great flavors. You just need the following ingredients to make this mixed drink. Pour half a can or 4 ounces of Cherry-Ahh Rita and another 4 ounces of Lemon-Ade-Rita in a mason jar or a tall glass with ice. Stir and garnish with a lemon wheel and a maraschino cherry before serving. You can also make this into a popsicle by pouring the mixture into popsicle molds. You can also add some chopped cherries into the mold for added texture. First, you need to release the aromatic by placing the mint leaves on the palm of your hands and slapping your hands together. Then, place the released mint, lime juice, and sugar into a glass and stir until the sugar is dissolved. Add ice and top with Bud Light Cherry-Ahh-Rita and give another quick stir. Place a lime wheel along the side of the glass and pop a maraschino cherry for garnish.